Sorry for the late update. I was in Hong Kong and now in the midst of claiming money for the travel insurance. I promise this post will be worth your wait. It's going to be a long entry. The silly Cathay flight was delayed and they wouldn't give us a reason. We din know what technical fault it was. They arranged for us to fly SQ later. Well, we were supposed to fly at 11 am. But I only flew at 3 pm with SQ. And when I reached at 7 pm in Hong Kong, the baggages were still with Cathay. We waited until 9 pm at the Hong Kong airport for our baggages. I got to know Victoria. She is so lovely. She kept me company and chatted with me. She drew a picture of me for me to keep and she said that I can post it in my blog to show everyone. She is 11 years old and very clever, talks like an adult. I only reached the Hotel at 10 pm. I din eat dinner in the plane and was famished. Thankfully, the shops in Hong Kong opens until 11.30 pm. I still have some time for dinner and desserts. 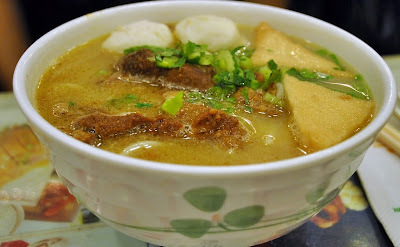 Dinner was taiwan mian xian. 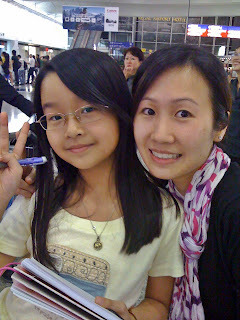 I met Wendy (my colleague from another dept) on the way back to the Hotel. I was complaining to her about my flight and baggage delay. Really shag out for stupid 6 hours of waiting *complain complain complain* then take photo. The next day, we had porridge for breakfast. The texture of their porridge is like soup. Very smooth and non-grainy. How did the rice become like this? The porridge is filled to the brim. I finished all of it. Mom had porridge too. Btw, did you notice that HKers like to dip their chopsticks into their cup of tea? I wonder why do they do that? Issit to "wash" the utensils? Anyway it's quite a cool idea and we followed. 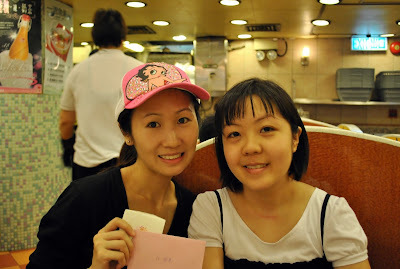 We met Emily (my secondary sch friend who is from Hong Kong) at our hotel lobby and we went to Chui Wah Restaurant for lunch (Central MTR). She gave me a handwritten card and a little present. 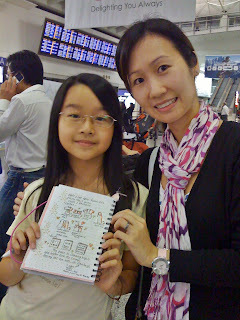 So sweet of her :) She has the best chinese handwritting in the world. My flight was delayed and she waited and waited for my sms. So sorry sweetie for making you wait. We chat and chat and forgot about panpan. 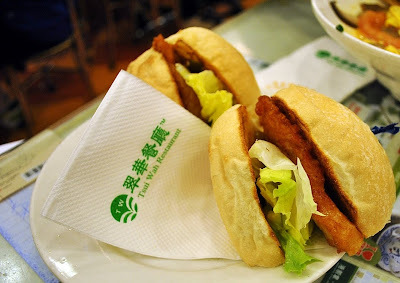 We also went to this very famous dim sum place called Luk Yu Tea House. It's the most expensive dim sum I've had but it's from Hong Kong and it's traditional. Luk Yu first started out in year 1933.Indeed very old. 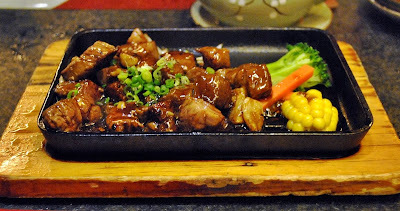 We also had Japanese buffet. Full to the max until the point of explosion. I was telling panpan after we left the restaurant that I had difficulty breathing. It felt as if the food is coming out from my mouth each time I took a breath. Apart from restaurants and cafes, we also ate from the streets. They are really good. I drank milk tea even though I can't take caffeine. Dun care... drink first. This is 10 times better than Singapore's. Same price but 6 instead of 3. We went St Mary's home of the aged to look for Sister Lucy. We visited the place and talked to the elderly folks. Sister Lucy says that she is unable to attend my wedding because she has difficulty walking nowadays and she apologised for not being present on my big day. She also gave me and panpan rosary amongst other handmade gifts from the elderly. So nice of them. Next, Halloween at Disneyland!!! Halloween Disney is open from 6.30 pm till 11 pm. Just in time to catch the last MTR. 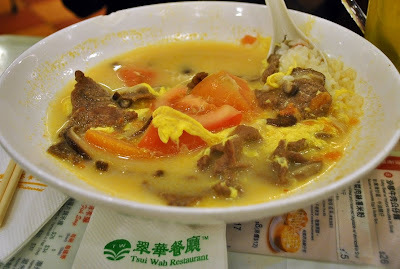 Talking about kiasu-ness, I had booked tickets a week before we flew to Hong Kong. 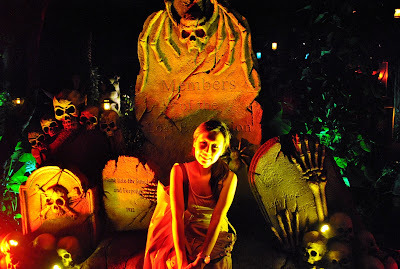 It's my 3rd time at HK Disneyland but my first Halloween there. It's very nice as the atmosphere is eerie and ghostly. There are skeletons, draculas, scary dolls walking around. The merchandise are totally in the mood as well. In fact, we heard 3-4 children crying because they are scared. The products are solely for Halloween nights and they don't appear in the daytime. We saw at 10.45 pm the staffs were busy keeping the Halloween products and decorations (trees, table, shelves etc). There were fireworks too. 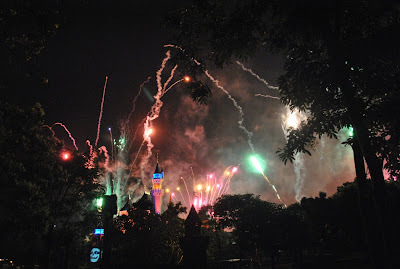 In fact, there are fireworks every night at 9 pm in all Disneylands around the world. I bought myself some skincare and magazines. The clothes in HK are too expensive. I didn't buy anything. I bought some stuff for my friends which I am not showing. Will pass to them when I see them personally. SASA doesn't give out any samples and Laneige is as stingy giving out free samples. Why why why? They used to be so generous with free samples even when I only bought ONE item from them previously. Hope you enjoy reading this HK entry. Very tired now. Going to bed. It's way past my bedtime. lovely trip....like ur bubble milk tea and takoyaki balls....gosh...wrong timing to see ur site at this hour! The halloween pics reminded me that Halloween's coming! Nice trip(minus the delayed at airport)! Nice post, and take good care! :)) Thank you people and Happy Halloween.